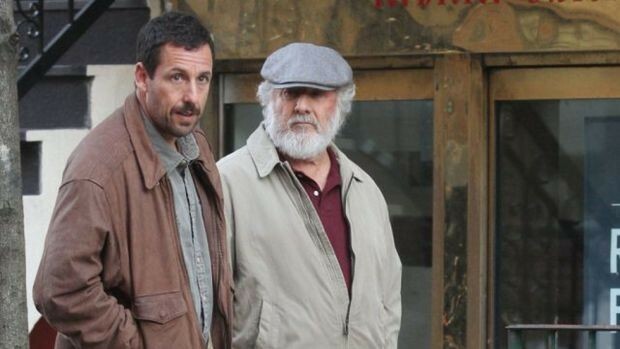 In one respect, Noah Baumbach's The Meyerowitz Stories (New and Selected), which is now playing at the Landmark Century and available to stream on Netflix, feels like a throwback to the American comedies of the 1930s and '40s. The dialogue sounds orchestrated—Baumbach paces and modulates his characters' speech with such care that the conversations play out like pieces of music. There's a polyphonic effect: the characters are always trying to speak over each other, interjecting some personal insight or grievance before their conversation partners have a chance to complete their own thoughts. There's a breathless quality to much of the patter; you're often not sure until after a scene ends whether certain lines were meant to make you laugh or cry. As Pauline Kael wrote about the comedies of Preston Sturges (e.g., The Lady Eve, Hail the Conquering Hero), you never know what hit you, even after you finish the film. Meyerowitz blends humor and pathos at almost every turn. The principal characters have all suffered disappointment for many years, and their speech and actions reflect lasting hurt. At the same time, they constantly vie for small victories in interpersonal communication—their frequent struggles for one-upmanship constitute battles to determine who has suffered more or longer. 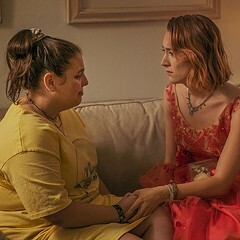 Baumbach generally plays these battles for bitter laughs, as the "winner" has nothing to gain except pity, and the other characters are too busy pitying themselves to expend it on anyone else. The rapid pace of the dialogue suggests that infighting has become second nature for the characters—even simple statements or assertions of fact carry tinges of buried resentment. The heart of the film belongs to Harold Meyerowitz (Dustin Hoffman), an aging sculptor who's never been considered more than a minor artist. As a younger man, he neglected two of his children, Danny and Jean (played as adults by Adam Sandler and Elizabeth Marvel), and devoted most of his affection to his youngest son, Matthew (played as an adult by Ben Stiller). At the start of the movie, Harold is retired and happily married to his third wife (Emma Thompson), but his feelings of inferiority still determine most of his interactions—he expresses a constant need to be in control of his environment, interrupting everyone he speaks to and forcing his opinions on anyone around him. His children represent the products of his inferiority complex. Neither Danny nor Jean is particularly successful, taking solace in anonymous lives, while Matthew is overly ambitious, making money hand over fist as an entertainment lawyer. Ironically Matthew is the most bitter and resentful of the three children—he seems to project his entire family's grievances in his anger at the world. The entire cast is magnificent, but Sandler's performance is the standout. Meyerowitz is his tenderest work since Punch-Drunk Love, and similarly calls on the actor to invert his typical comic persona to portray an introverted soul who has trouble expressing his frustrations. Danny, we learn, harbored musical ambitions as a young man, but failed to act on them because of his embarrassment of performing in front of audiences. A college dropout, he never pursued a career because he chose to stay at home and take care of his daughter while his wife earned a living. The film begins with Danny moving into his father's apartment after separating from his wife. Before he arrives, there's some funny business involving his difficulty to find a parking space in his father's neighborhood. He yells at the drivers preventing him from parking, but as his daughter (the more grown-up of the two) informs him, the other drivers can't hear him. His anger, both here and throughout the movie, has nowhere to go. Danny adores his father despite the fact he never received enough of the old man's attention. In fact Danny's generally a loving presence, compensating for his self-hatred by directing affection toward others. It's worth noting that when Sandler's onscreen the pace of the dialogue usually slows down, a reflection of his character's willingness to hear others out. Yet the most understated performance is Marvel's portrayal of Jean, a solitary woman who internalizes her frustrations to the point of seeming invisible. Baumbach still gives Marvel an opportunity to shine—his sympathy for actors is one of the film's greatest accomplishments—with a third-act monologue about having suffered the sexually predatory behavior of one of her father's colleagues when she was an adolescent. This monologue darkens the movie considerably, revealing a legacy of pain that hadn't been addressed until here. Meyerowitz never recovers its brisk pace after this, with Jean's memory of abuse weighing down the remainder of the picture. Baumbach concludes the film on a relatively optimistic note, with the characters reconciling their animosity and beginning to move on with their lives. Yet they all seem somewhat exhausted by the end, having gone through personal ordeals. Harold's selfish behavior takes a toll on everyone, including Harold, and it seems like no one will ever fully recover from the familial dysfunction that defined their pasts. Like the humor of Meyerowitz, the conclusion gives way to sorrow as it lingers in the memory.